Specificity :Anti-Myc antibody recognizes the N-terminal or C-terminal Myc-tagged (EQKLISEEDL sequence) fusion protein. 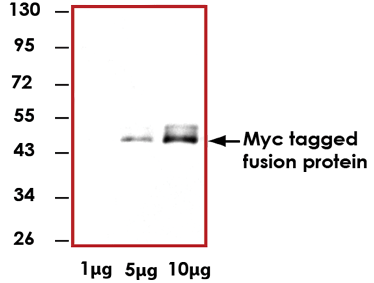 Sample Data :Representative western blot (1:1000) using in a positive cell lysate that contains Myc tagged fusion protein. Scientific Background :The Myc epitope tag (EQKLISEEDL sequence) is highly charged and consists of ten amino acids derived from the Myc protooncogene. The cMyc protooncogene is a transcription factor regulating approximately 15% of genes, and is involved in cell proliferation, differentiation, and apoptosis.